To adjust the settings for DarkWave Studio first launch the program and then go to the View->Options menu item. When you start DarkWave Studio for the first time it will have chosen DirectSound as the default audio driver. DarkWave Studio also supports Null (Silent), Windows Waveform Audio, and ASIO. By default ASIO support is disabled. To enable ASIO support, close DarkWave Studio and go to the Windows Start Menu and run DarkWave Studio->Enable ASIO Support. In most cases DirectSound is the right choice. The Null (Silent) driver is for special cases where you do not want any sound card used. Windows Waveform Audio driver is slower than DirectSound and is not really much use. Some people have ASIO supporting sound cards with custom ASIO drivers, in which case ASIO may be the right choice. Defaults to Primary Sound Driver. This is the device Windows normally plays sound on. You can choose a different device if you like. When you select a different output device the available choices for Sample Rate, Output Bits, and Output Channels will update automatically. This too defaults to Primary Sound Capture Driver. You may change the device to specify a particular sound capture device. If you are sure you do not want sound input from a microphone or guitar for example then choose Input Disabled as the input device to improve performance. The sample rate is how many samples per second are recorded from the input device, processed by DarkWave Studio's machines (synthesizers and effects), and the samplerate used with the output device (such as your PC speakers, headphones, or a stereo. To be efficient DarkWave Studio uses DirectSound's full duplex mode to record, process, and output all at the same sample rate. The default setting of 48.0kHz is reccomended. CD quality is 44.1kHz. Output Bits and Input Bits should be set to 16, which is CD quality. Internally DarkWave Studio uses 64-bit audio data but from the input and to the output devices 16 bits is the best you will get. Output Channels and Input Channels allow you to choose the number of channels for the input and output devices. At the moment only Mono and Stereo are supported. Samples is the number of samples in the input and output buffers. A large number of samples is less likely to skip or stutter due to lack of CPU processing power or limitations of the audio hardware and drivers. If you need low latency, such as when playing a MIDI keyboard with DarkWave Studio, you can try lower values than the default. If you get skipping you can increase the number of samples. 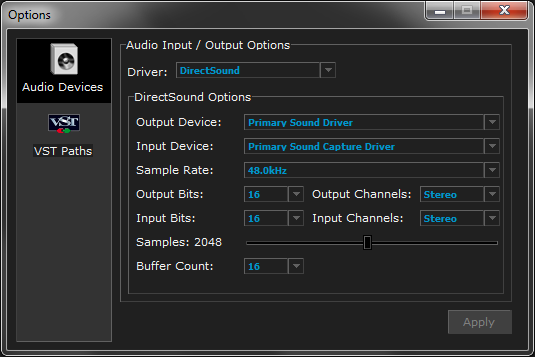 The Buffer Count allows you to control how many buffers are used with DirectSound. Like the number of samples in a block, decreasing this value gives you lower latency at the cost of potentially skipping. If you experience skipping or need better latency you can experiment with both of these values to find out what works best for you. Clicking Apply after making a change to these settings will cause DarkWave Studio to immediately close audio input and output and then reopen them with the new settings.